Here you will find many useful faqs and tips to help you ease through your embroidery projects. #1 Rule- Always read the Chart and any other information that comes with the Design. Ok you got your expensive new toy and you are ready to play. First you will want to know what format to buy all the fun designs in. It should state in your owner's manual but here is a quick list to put your mind at rest if you just couldn't find the format you need in your manual. Not all machine formats keep true to the the original colors used in the design's creation. Gail offers the formats that are in bold. --Fabric poking out or showing through stitiches. Here is a little information about different stabilizers you may want to use at some point. Stretch Denim, Knits, Fleece, corduroy, velvet, Toilet Paper. Can be used in multiple layers. Appropriate for large filled designs. Just as the name states, Cut-a-way from the design once completed. Best for Cotton, Satin, Corduroy, Canvas and Toilet Paper. Remove slowly not to damage design. FSL(Free Standing Lace), Used on top for Towels, corduroy, knits. Perfect to use when embroidering on towels to keep nap from poking through stitches. Can be used as top & bottom Stabilizer. Hoop the stabilizer with the sticky side up, then place fabric on the sticky sidewithin the hoop. Can be used similar to Sticky Back stabilizer. Remember anything sticky or made with glue may gunk up your needle. Can be torn away or peeled off. Can be used with regular tear-away stabilizer. There really is no "art" of hooping but it is important to get it right. You mainly just want the fabric FIRM in the hoop. Firm not excessively tight. Loose is not good either. Tight or Loose can throw off a good sewout from the start. Try practicing hooping your stabilizer with the fabric and without. You also may be able to just slip a piece of stabilizer right under the hoop, meaning it's between the hoop and the plate/feed area of you machine when stitching. Lots of people use this method. Practice make not neccesarily perfect but gives you all kinds of options to perfect your own hooping and stabilizing techniques. Three top reasons a design's outline may be off. Machine Settings - consult your machine for tension settings or schedule maitenance for your machine with your dealer. Poorly Hooped Fabric - Fabric needs to be firm, not tight or loose. Stabilizer - Sometimes Floating the Stabilizer will cause outlines to be slightly off. Hoop Stabilizer with Fabric if possible. Yes, I must admit sometimes it just comes down to the digitizing of the design. 1. Use medium to heavy weight Cut Away or Tear Away Stabilzer but never actually tear it from the tp. 3. Check your tension settings. 4. Use the slowest machine speed possible. 6. Add extra stabilizer between hooped sheet and machine if needed. 7. Add another tp square under the already doubled tp square for more padding if needed. 8. For sewing White on Toilet Paper. Just use a slightly different shade of white. Usually regular white will show up just fine because its a different medium than the toilet paper but it may not show well in photos. Just try different shades till you find the one that works best for you. 9. From my understanding any design can be sewn on toilet paper. You may have to adjust tension settings and stabilizer to compensate for the extra density. I have provided a Free Placement Stitch for anyone wanting to attempt this with normal designs. Sew this out first on your hooped stabilizer for any design for the 4x4 Hoop and it will help you line up your TP square that you will be sewing on. I am not responsible for 3rd party designs. 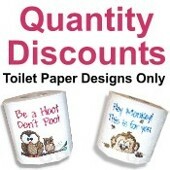 All GoodiesByGail Toilet Paper specific designs come with their own placement stitch included. When choosing your needle choose the Needle Size according to Thread Thickness you will be using, also choose a Needle Type according to your Fabric. --Popping Sounds made by your Machine. Schmetz has come up with a new Color Guide to identifying their needles. Here are the most popular needles. 2. Makeup Brushes aren't just for your face. Sew on a lot of fuzzy fabric or Toilet Paper designs? I bet little dust bunnies are breeding like crazy in your machine. Well get you some of those disposable mascara brushes from a beauty supply store. These will do wonders cleaning the nooks and crannies those little dust bunnies like to fill in. Also if you misplaced the brush that came with your machine, pick up a blush brush while your at it and start sweeping the bobbin case. 3. Trouble threading needles? Not everyone has one of those fancy machines that thread themselves but also some of those only thread certain size needles. Well next time your having troubles try cutting your thread end at an angle. I also sometimes will wet the end also. If you have a good back lighting behind the needle then the point will slip through the eye easily. 4. Get extra grip with your hoops. Want to make sure the frabric you are embroidering on doesn't slip while in the hoop. Use some of that 3M medical tape that doctors use instead of bandaids. You can buy this at the pharmacy where they sell the gauze. Snip a few short pieces and wrap them around the bottom hoop in various places. This will help keep your fabric from slipping. It's not sticky and won't leave a residue on your hoop. 5. Shifting Help. Try basting the fabric to the stabilizer. You can hand or machine baste. This will help keep the fabric from shifting. Some embroidery machines can baste the fabric to the stabilizer while in the hoop. 6. Pre-Shrinking Interfacing? Don't forgot to check if your interfacing is already "pre-shrunk". You can pre-shrink interfacing. Do NOT use a washing machine. Soak the interfacing in cool to room temp water. Never use hot water with fusible interfacing. Towel dry or Line dry to prevent misshaping. 7. Thread Breaking? If you are still using Rayon thread, it's time to change over to polyester embroidery threads. They are stronger and more colorfast. Rayon is the weakest of embroidery threads so for breakage try lowering your tension. 8. Bobbin Thread Showing Up Top? Check that your thread is coming off the spool smoothly and without resistance. Also check that the thread path is clean with no lint and the thread is traveling properly through the thread path. You may need to loosen your tension. 9. Pinning your Seams? Lay the pieces of fabric on a flat surface and line up the edges of the fabric. Place the pins perpendicular to the edge of the fabric, keeping the pins further back than where the seam stitching will be. Never sew over the pins, this could damage your machine! Keep lining up the edges of the fabric and placing the pins for the entire length of the seam. If the the fabric lays flat but the ends don't match up check your measurements and cuts. 10. Need to get rid of a tough Grease Stain? I have found over the years when it comes to Grease stains on fabric, you will find THAT one stain that just won't come out with the usual methods. Let me tell you about a product that I just love even though I can't stand the citrus smell of it. Its called De-Solv-It. Spelled just like that and you can find it in the isle with the cleaning products. I buy mine at Walmart. Let me tell you WHY I love it. I had a few shirts over the years that have gotten mysterious grease stains on them. They were washed and dried many times and the stain never came out. Once I used De-Solv-It on it (in some cases over a year later after getting the stain) It came right out. You would never have known the stain was there to begin with. Give it a try before tossing your fave clothing because of a stubborn grease stain! 11. Looking for Free sewing resources to practice and learn by? Don't forget your local library. They have just as many sewing books for you to learn by as your local craft store has. Of course remember it's Free from the library. A good look in the Children's section will get you some excellent books for Beginning Sewing. 12. How do you sew a straight line? I know so simple why mention it. Well my mother is great at hand sewing but she is a mad woman when it comes to a sewing machine. lol So hopefully she will read this. First off I would like to tell her to stop being a lead foot on the pedal. Glad she doesn't approach driving a car the way she does her sewing machine. Then she wonders why her stitch is not straight. Well till you get the hang of it I suggest you slow your machine down. Now make sure you line the edge up with one of those lines on the plate under your presser foot. The further the line from the presser foot the bigger the seam. Whichever line you choose make sure you stick to matching the edge of the fabric with it but go slow. "Walk" your machine don't "Run" until you are in more control. Before long you will be zipping through there like an expert. 13. Having trouble with a bobbin? Next time try putting that bobbin on the upper thread pin and then put a new empty bobbin on the bobbin winder and "REWIND" the bobbin.No need to waste good thread. 14. Need to stick it to your appliques? Use a Glue Stick. Only use the ones that say "water soluble" on them. They will help you breeze through the applique process. 15. Is my Thread past it's prime? Thread does age. If your experiencing a lot of breakage and you know you have had that spool of thread for over a year or more then maybe you need to throw it out. Thread gets weak with age. A good sign your thread is beyond it's life expectancy.... A wooden spool. LOL Those are ancient. Toss it. 16. Do I need a new needle? If your sewing machine all of a sudden starts skipping stitches, or breaking thread or experiencing any kind of stitching problem, change the needle. Dull, bent, or the wrong size can create all kinds of problems than will lead to disasters. Make sure you use the right needle for your machine and it's the right size for the thread and materials being used. 17. Oh No I dropped my needle, now where is it? Keep and strong magnet handy whenever you are sewing. By hand or by machine. I have learned the usefulness of this item this past week. Thank goodness my mother had an extra magnet I could have. It is the best companion when you drop a need or when your needle tip breaks on your machine. Before removing your fabric run the magnet over it right under the broken needle so the tip can be picked up. If you move the fabric first, the tip may go flying off in an un-seen direction. 18. Rayon or Polyester? Well this may help you choose. Rayon thread is very shiney, smooth and pretty. It is hand-washable and can be pressed with a warm iron. Not so good on items that will be washed or machine dried often. Polyester thread is very versatile. Not only can you machine wash and dry but it can also be dry cleaned. It is also colorfast. 19. What's in a Basic Sewing Kit? A basic sewing kit for people who sew by hand should have at the minimum these following things. A selection of buttons, needles and threads. A good pair of sewing scissors. Pins and pin cushion. A thimble. A tape measure. A few fasteners such as snaps, hook and eyes. Self-fastening tape and an assortment of patches. Put all this in a cute gift basket for someone who likes to sew or is just starting out, it will be much appreciated. 20. How do I curl Non-wired Ribbons? Well I can tell you about 2 types of ribbon. Curling Ribbon - This is the ribbon you find on balloons or gifts. This is the most simple. Hold the ribbon tight and drag it across the blade of a good pair of scissors. Fabric Ribbon - This is the non-wired type of ribbon that you can embellish packages or baskets with. Get some sort of rod shaped item like a dowel rod or a pencil. Wrap the fabric around the rod shaped item. Make sure the ribbon does not overlap or touch. Secure the both ends with tape, clothes pin, clamp or something similar. Then spray the ribbon with spray starch. Make sure it is completely covered with a generous amount of starch and let dry. Find a spot so that it can sit upright with nothing touching the ribbon. Just slide the ribbon off when completely dry. Depending on your ribbon material you may want to test on a small spot before doing a complete curl, just incase the spray starch has a negative reaction to the ribbon. 21. Another way to curl Ribbon- A dear lady named Doris emailed me after last week's tip went out about curling ribbon with a 3rd option. I have never tried before and unfortuneately do not currently have any fabric ribbon to try it out on. I am passing it on to you if you would like to give it a try. Thank You Doris! Bake the ribbon wrapped around the dowel in a 250 degree oven for about 10 minutes. Let cool completely. Use the wooden clothes pins to secure the ends of the ribbon. Once cooled you may have to use a little Fray Check on the ends of the ribbon. This process curls the fabric ribbon so good it lasts through washer and dryers. No need to use Spray Starch and the ribbon doesn't burn. 22. Hair Clips- If you have little girls around the house you may already know this. My daughter is much older now so I have a bunch of those little springy clips left over. They are great to use when embroidering on something that you need to hold some of the fabric out of the way of the needle. Small investment if you don't already have some around the house.